Download "Secure File Transfer Using USB"
2 International Journal of Scientific and Research Publications, Volume 2, Issue 4, April other peoples malevolently, then also the file is secure, as legal file owner cannot obtain agreement key used for decryption until authentication server suspends his account. CHARACTERI STIC SYMMETRIC KEY CRYPTOGRA PHY ASYMMETRIC KEY CRYPTOGRAP HY Key Used Public Public and Private Speed Very Fast Slow Size of Resulting Ciphertext Same/Less than Plain text More than Plain text Key Agreement Big Problem No problem at all Used for Encryption/Decr yption Encryption/Decr yption and digital signature Table 1: Difference between Symmetric and Asymmetric Cryptography In this proposed system, we will be using asymmetric cryptography as it provides secure key exchange agreement. The differences among various asymmetric algorithms are given in Table 2. Figure 1: Overview of System The operational flow of the system is as shown in figure 1. User first inserts a USB device. The system then forces user to pass through authentication process in order to access USB device. The user is thus forced to input username and password. This username and password is verified by authentication server called as AS. If the username and password is matches, then the person is valid user and thus AS provides him with the session key. If username and password does not match, then the user is invalid and is restricted to access USB device. The session key which is acquired by the valid user is used to encrypt the file to be stored in USB devices. This file is then stored on USB device securely. In order to decrypt the file, user has to go through the same verification process mentioned above. CHARACTE RISTIC Proposed By Speed Primarily used for DIFFIE- HELLMAN Whitfield Diffie and Martin Hellman Fast in Key and slow in verification Key and Encryption/ Decryption RSA Rivest, Shamir and Adleman Slow in Key and fast in verification Key and Encryption/ Decryption DSA NIST Fast in Key and very slow in verification Key III. CRYPTOGRAPHIC ALGORITHMS Encryption algorithm is used to encrypt/decrypt the files in order to save them on USB devices. This provides security to files in case the USB device is lost. In general, there are two types of encryption algorithms used in cryptography. They are symmetric and asymmetric algorithms. 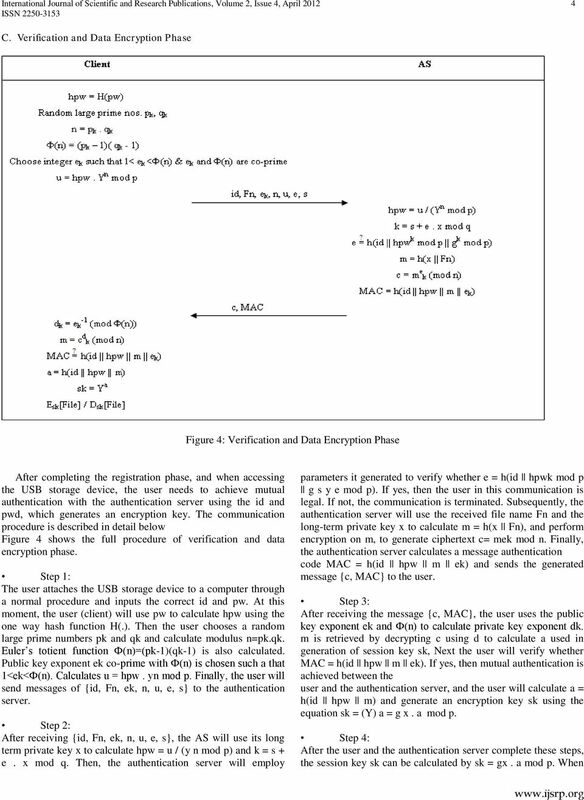 Symmetric encryption algorithm includes AES(Advanced Encryption Standards), DES(Data Encryption Standards), IDEA(International Data Encryption Algorithm), Triple-DES etc whereas Asymmetric encryption algorithm includes Diffie- Hellman, RSA(Rivest, Shamir and Adleman), DSA(Digital Signature Algorithm) etc. Hybrid algorithm is formed by combining Symmetric and Asymmetric algorithms depending on their pros and cons. The difference between Symmetric and Asymmetric algorithms is listed below in Table 1. 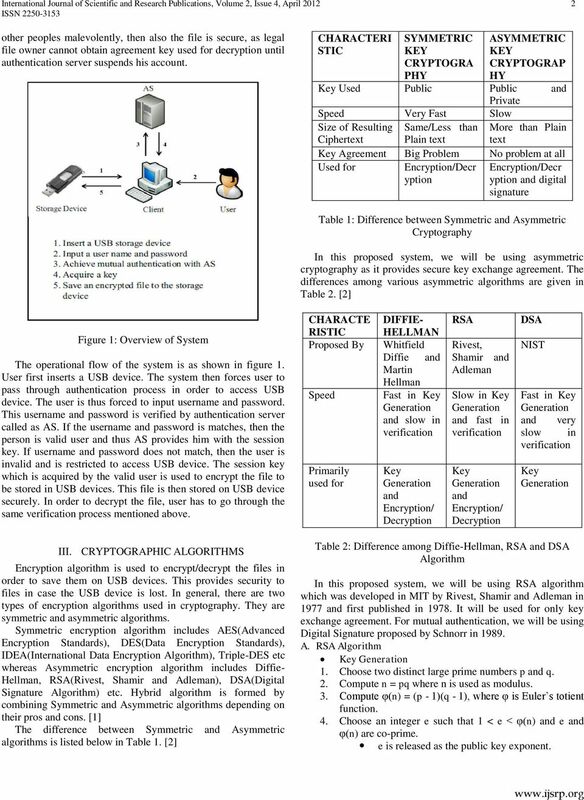 Table 2: Difference among Diffie-Hellman, RSA and DSA Algorithm In this proposed system, we will be using RSA algorithm which was developed in MIT by Rivest, Shamir and Adleman in 1977 and first published in It will be used for only key exchange agreement. 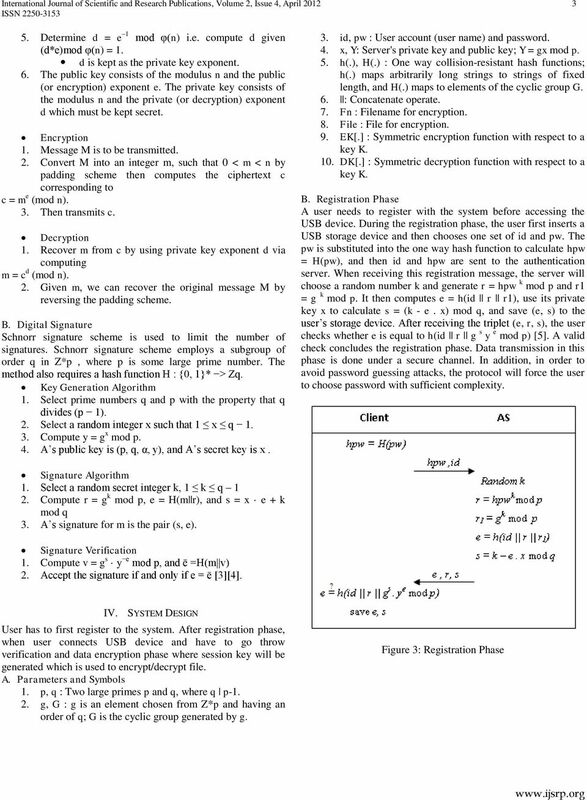 For mutual authentication, we will be using Digital Signature proposed by Schnorr in A. RSA Algorithm Key 1. Choose two distinct large prime numbers p and q. 2. Compute n = pq where n is used as modulus. 3. Compute φ(n) = (p - 1)(q - 1), where φ is Euler s totient function. 4. Choose an integer e such that 1 < e < φ(n) and e and φ(n) are co-prime. 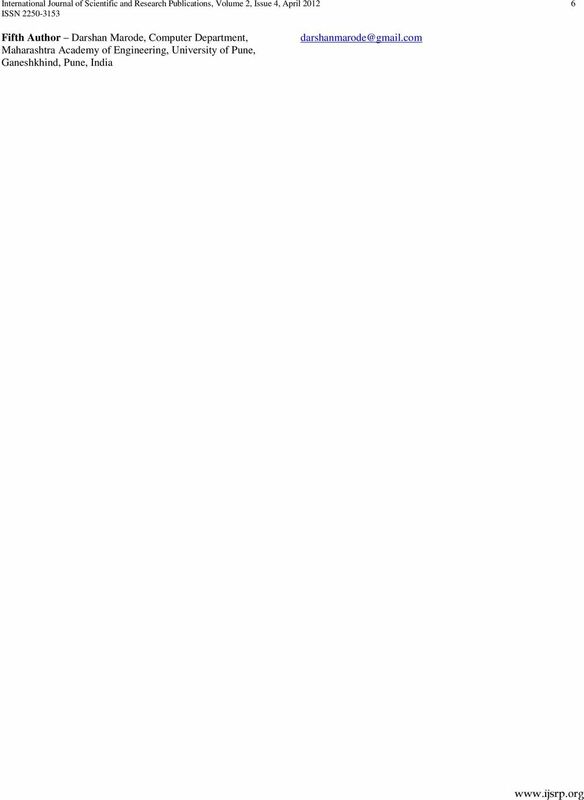 e is released as the public key exponent. PGP (Pretty Good Privacy) INTRODUCTION ZHONG ZHAO In The Next 15 Minutes, You May Know What is PGP? Why using PGP? What can it do? How did it evolve? How does it work? How to work it? What s its limitation?